Purchase 50 or more CPR Face Shield - Filter Type - (Pack of 50)s and download your free support pack worth £100. Purchase 200 or more CPR Face Shield - Filter Type - (Pack of 50)s and you can have personalised covers absolutely free! 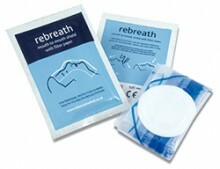 A single sealed packet containing one 'Rebreath' mouth to mouth shield with filter paper. Fits over the face and neck of the patient with a filter section around the mouth area. 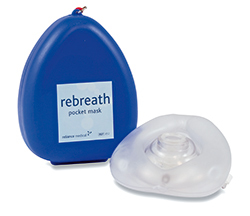 Allows personal protection during a mouth-to-mouth resuscitation. Unlike many face shields on the market this type do not increase air flow resistance significantly. Nigel's Tip: These are a perfect barrier for students practising CPR with the added benefit that the students get to practise using a face shield barrier. If you use alcohol wipes when training keep some of these handy as an alternative for students who don't want to come in contact with alcohol.